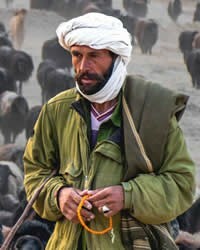 Overview: The Brahui are an ethnic group of some 2.5 million with the majority living in Pakistan and smaller numbers in neighboring Afghanistan and Iran. They are almost all Sunni Muslims. 'Brahui' is a very old Dravidian term and Brahui origins are disputed. They are thought to be Dravidian peoples who migrated to the Baluchistan region of Pakistan and intermingled with peoples of Iranian origin.